Weight-loss supplement derived from linoleic acid which helps maintain normal cholesterol levels (1). Produced from precious safflower oil. Part of the omega-6 family of essential fatty acids which the body cannot produce. With changes in the way livestock are reared - they're increasingly grain-fed rather than grass-fed - meat and milk now contain three times less Conjugated Linoleic Acid (CLA) than before. Animal research, backed up by recent human studies, have shown that CLA supplementation may suppress the appetite and reduce body fat mass while maintaining lean muscle mass. 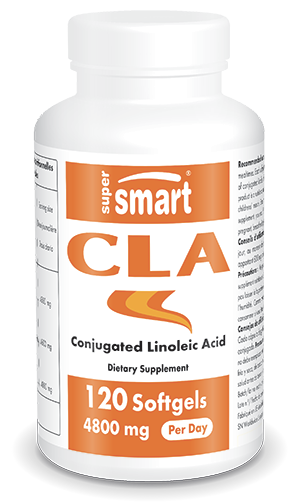 CLA is essential for transporting fats in cells, where they are used to produce energy. In one animal study, supplemented mice lost up to 60% of their body fat and gained 14% of lean body mass. A human study published in August 2001 in the International Journal of Obesity reported a significant reduction in abdominal fat after four weeks' supplementation with 4.2 grams CLA a day. A more recent study suggests this success might be due to a reduction in the size of adipocytes, and perhaps - when combined with a moderate intake of caffeine - a reduction in their number too. CLA supplementation also reduces age-related protein damage and plays an active role in preventing several forms of cancer. Other ingredients: Glycerol, water, a combination of tocopherol. Tonalin® CLA is an exclusively licensed product of the Cognis group. Each softgel capsule contains 1,000 mg of Tonalin®. Take one or two softgels with meals that have the lowest fibre content (three to six softgels a day).